Last week, we marked 14 years since the September 11th terrorist attacks and memorialized the 2,977 people we lost. What many don’t know is that the death toll did not stop on that day. In fact, it has continued to rise as those who ran into the buildings, who worked on the pile, and who lived in lower Manhattan have succumbed to the 9/11-related illnesses they developed as a result of the toxins inhaled at Ground Zero. 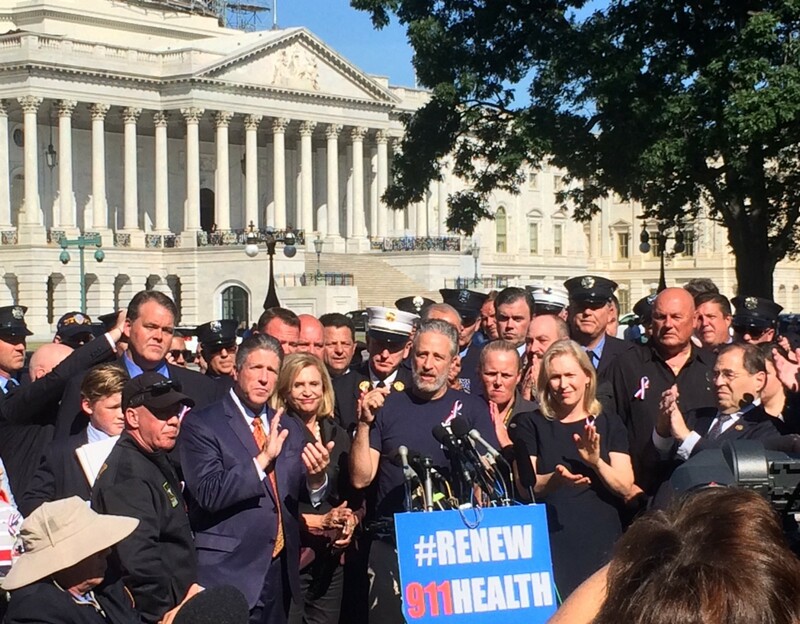 In 2010, Congress passed the James Zadroga 9/11 Health and Compensation Act to make sure that our 9/11 first responders, survivors, and their families had the health care and benefits they had earned. However, the bill that passed was a compromise and only funded these essential programs for five years. Now, the legislation’s two central programs are about to expire and in order to ensure these programs continue, I’ve introduced the James Zadroga 9/11 Health and Compensation Re-Authorization Act. With 36 co-sponsors in the Senate and 151 in the House, this legislation is broadly bipartisan. What’s lacking is the sense of urgency to pass it and make these programs permanent so that first responders, survivors and their families no longer have to walk the halls of Congress to lobby lawmakers to do the right thing. We have an undeniable moral obligation to ensure the money we need for this health care and compensation for our first responders and community survivors is there for them in their time of need. The illnesses our first responders suffer from will not suddenly expire, neither should the health benefits they rely on. It’s time to pass this important bill. The World Trade Center Health Program, which cost $1.4 billion, has enrolled more than 72,000 people from every state in the country. Participants live in 429 of 435 congressional districts. The program has created a specialized network of health experts who specifically treat the cancers tied to Ground Zero. Funding for this program is set to expire on September 30, 2015. The September 11th Victim Compensation Fund, which was funded at $2.77 billion, has helped 6,285 Americans impacted by the tragedy of 9/11. This funding is set to expire in October 2016. — More than 33,000 9/11 responders and survivors have at least one injury or illness caused by the attacks or their aftermath. Two-thirds of these individuals have more than one illness. — More than 4,166 individuals have been diagnosed with at least one 9/11-certified cancers, and 4,900 cancers have been found among 9/11 responders and survivors. — Since 9/11, 1,700 first responders and survivors have been laid to rest. More police officers have died since 9/11 than were killed on 9/11. It took years of lobbying from first responders, survivors and advocates to pass this bill in 2010. Men and women in wheelchairs and on oxygen machines came to Washington to compel Congress to do the right thing, and their story got the attention of former Daily Show host Jon Stewart. Jon has dedicated a few of his broadcasts to shining a light on this issue — including one of his last episodes that I was privileged to join. Now, Mr. Stewart has come to Washington, where he is joining hundreds of first responders, survivors and their supporters to once again demand that Congress do its job and make these programs permanent. He will help bring the attention this issue needs. But I know we won’t be able to do it without your help. As I told Jon on my Daily Show appearance in July, the only time anything happens in Washington is when ordinary people stand up and make demand action. That’s what I need from you today. I hope you’ll join today’s day of action by raising your voice on behalf of our brave first responders and help convince Congress that it’s our moral obligation to re-authorize funding for these critical programs. Send your U.S. Senators and Representative an e-mail urging support for the James Zadroga Re-Authorization Act, let them know it’s our moral obligation. Use our share page to amplify this message to your online networks. Tweet and Facebook your support for this important legislation. 3. Respond to this post using Medium’s Response function below and let your followers know you support this effort. Thank you for your continued support and for making your voices heard on behalf of our 9/11 heroes! Mom to Theo, Henry and dog Maple. Wife to Jonathan. U.S. Senator from NY and candidate for president. Text BRAVE to 60980 to get updates from Gillibrand 2020!